Did you feel like playing League again after the last article or is it more like going down the creek? I hope it’s the former. Riot is now taking the matter into his own hands and leading us into new areas. What kind of areas? A new game mode. You might say: “Well, that might be another boring one.” But wait a minute, I’ll explain to you 5 reasons why Nexus Blitz is a fun mode to play. Let’s start with the new map, which reminds a bit of Twisted Treeline. But this time it’s 5v5 instead of 3v3, there are two lanes and of course a jungle. Now, however, the jungler gets a backup in case you flame him again. Because who jungle in pairs gets bonus experience and don’t try to counter jungle, because every jungle site has a tower now. 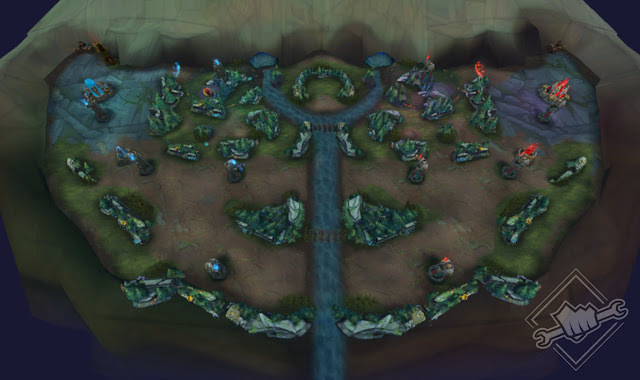 Something completely different, plus blue and red buff are located in the middle of the map or in the middle of both jungles. That means, who wants to pick up a buff, will not be able to get past a fight. You read right, there’s a hint of nostalgia in the air. In the shop of Nexus Blitz, you can buy a number of old items. Among them Deathfire Grasp, Atama’s, Force of Nature & more. If you don’t know which items they are, try them out now! If you then really get going and kill a number of champions, you get a buff that makes you stronger but also more vulnerable to damage. Old but Gold Baby! What is the current game trend? Exactly, Battle Royale. So Riot thought: Why not add a Battle Royale in League. This feature occurs in so-called events. Every few minutes a new event appears on Nexus Blitz, which keeps the game flow amazingly fresh. Either you chase a fast Teemo, throw snowballs at your opponent’s team, stay in a certain spot to become King of the Hill or the map becomes smaller à la Battle Royale. Of course, Riot had a quick look around at rival Blizzard as well to add a famous payload to Nexus Blitz. At the event, you accompany a Sion in his ultimate to tear down the enemy tower. Funny as hell! Unlike Summoners Rift, the games last only about 15 to 20 minutes. Every champion gets passive gold from every minion death and through the rewards at the events, it snowballs very quickly. But that’s not bad at all, because if a team has the upper hand, the game is usually over in the next five minutes. No long-suffering for 20 or 30 minutes until the nexus has finally fallen. Although Nexus Blitz is still in experimental status, Riot is already thinking about a potential ranked system. If the mode makes it to the live servers and the feedback from the community is positive, we could soon get a new Elo. But even if it may not come to a ranked system, you can look forward to crazy team compositions and tactics. What are your first impressions of Nexus Blitz? Do you think the new game mode has potential? Let us know in the comments! Have fun discovering!